"I want the UK to be the world's leading Internet economy... I am bringing forward our target for getting all Government services online to 2005... people and businesses will be able to access Government services 24 hours a day, seven days a week." Last week, the National Audit Office updated us on progress. For some reason, it seems that despite spending £1bn, and despite ongoing costs of £208m pa, the stock to form the 24/7 departure is still stuck on its inward journey at Crewe. As it happens, your correspondent spends a deal of time on government websites, trying to track down information. It's rarely a good experience. Sites such as the Department of Health, the Home Office, or the Office for National Statistics, contain huge masses of stuff. But their indexing systems are usually either incomplete or impossible to fathom, while their dedicated search engines are very poor, throwing up a million possibilities or nothing. You end up scrabbling through page after page of dense text, clicking on a whole string of links, opening a massed confusion of new windows, swearing and spilling cocoa over your keyboard. In fact, unless you know specifically where to look, it's usually faster and much much kinder on the nerves to Google. "Most department and agency sites were unfavourably compared with participants’ experiences of commercial sites, especially banks and travel sites. Participants said that they found department and agency sites hard to navigate, particularly when arriving at the homepage. Internal search engines, in particular, were found to be unhelpful in finding the information being sought." Part of the problem seems to be the not-invented-here-syndrome: a deeply entrenched unwillingness to use off the shelf industry standard solutions. Not only does that mean we taxpayers have to pay more, but the resulting system isn't tried and tested. To make matters worse, since 2004, the government has thrown its previous website strategy into reverse. Originally it let every tinpot department and offshoot set up its own independent site. The result was 951 separate identified websites- an extraordnary number with an extraordinary pricetag. Our flipflop government's new cunning plan is to do the opposite: to slash this number, and focus instead on just two so-called supersites: Directgov and businesslink.gov.uk. The question is, why should we believe that be any better value for money? "There is no parallel to the UK’s planned supersite strategy overseas and interviewees from our comparator countries viewed it as a very radical step." Where government IT is concerned, those are the very four words you never want to hear. 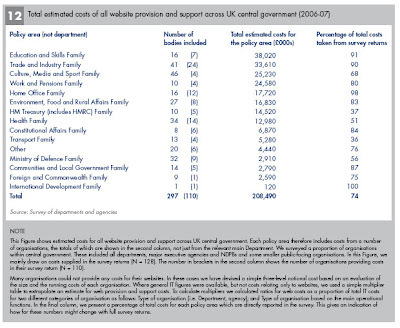 *Footnote- The NAO's departmental website costs are only estimates because "many organisations could not provide any costs for their websites". But why would they bother? It's not their money.